Many patients who have lost teeth have high expectations of dental implants, including perfect functionality and aesthetics. Not long ago, the only options for replacing missing teeth were bridges, dentures or partial plates, and in many cases these led to satisfactory results. Hoewever, these methods will never create the feeling of natural teeth. The fact that these "teeth" are removable is hard to get used to, and for many patients is neither satisfactory nor desirable. Fortunately, implantology allows us to create artificial teeth that feel and function just like your natural ones. 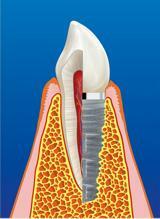 We can also achieve the best aesthetic results with dental implants. If few or no natural roots are present, implants are the method of choice in order to achieve a natural-looking firmly attached tooth replacement. Missing teeth cause the jaw bone to recede, the cheekbones then sink and make the face appear older. Implants help to avert or stop this unpleasant process. 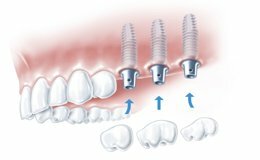 The basis of all implant treatments are one or more titanium roots that are set into the jaw and will be incorporated by the bone. 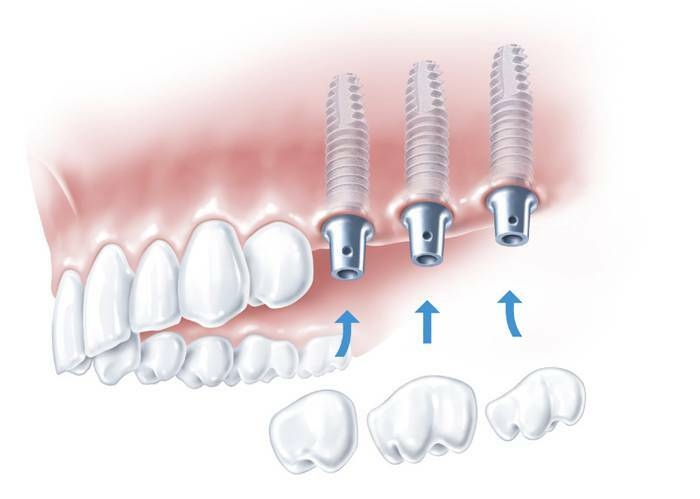 These firmly anchored implants provide the foundation for perfectly functioning and cosmetically satisfying tooth replacement. When planning the surgery, x-rays help to determine the positions of the future implants. Furthermore, the bone structure and the anatomy have to be taken into account. Under local anaesthesia, the implants are inserted into the jaw bone. Then the positions of the implants are controlled by x-ray. After this procedure, the operation site will be closed with sutures which will be removed one week later. In the following three to six months, the implants will heal into the jaw bone. During this time you can wear a temporary prosthesis. After the implants are healed in, we expose them to control their location and stability once more. Then the permanent prosthesis will be produced in our dental lab. We can basically mount any type of prosthesis on implants: individual crowns, bridges,dentures and partial plates. 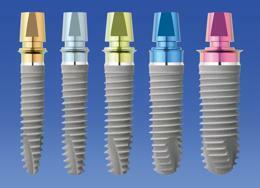 Implants assure perfect functionality, superb comfort and excellent aesthetics.